IntyBasic | Welcome to the Intellivision Revolution! IntyBASIC is an integer BASIC language cross-compiler for Intellivision that helps greatly to ease game writing. IntyBasic was created by the very talented NANOCHESS. Others have contributed as well to the fine tuning of this program. IntyBasic a command-line integer cross-compiler of a small subset of BASIC, it generates assembler for using with as1600, that in turn generates the final executable runnable in real Intellivision and/or emulation via jzintv. SCROLL and BORDER statements have now been implemented, as well as path selection for libraries using a command-line argument. Platforms supported: Wind0ws, Mac OS X (32/64 bits) and Linux. Visit the Intellivision Programing forums on Atari Age. Visit the Yahoo IntvProg forum. Donations are welcome to help support the development of the IntyBasic Compiler program. All donations go directly to NANOCHESS and are completely voluntary. Help support this great development tool that should help enable more great games for the Intellivision! 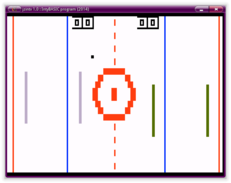 The following is a list of all known games and demos utilizing the IntyBasic Compliler program for the Intellivision console. Some of these may never make it to a full fledged CIB release. Anything not shown in the list feel free to add by using the CONTACT US form.